Get ready to dive into an underwater adventure, defeat the mighty kraken and win big! 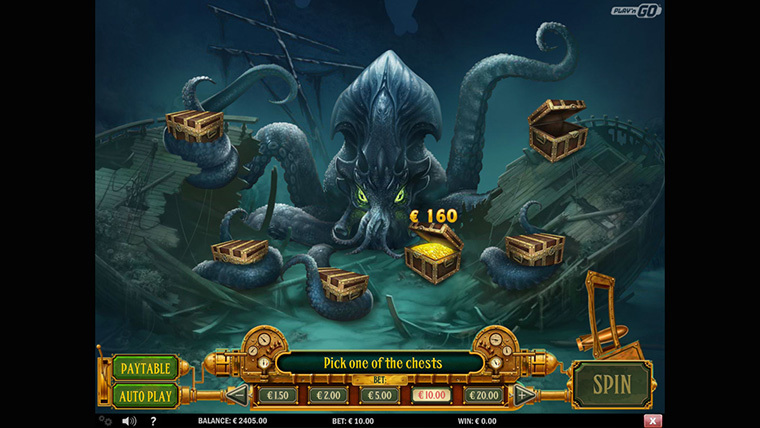 Play’N Go launched an amazing video slot called Eye of the Kraken and it will surely tickle your mythological bone. With a tiny grid of 3×3 placed in the centre of a beautifully designed backdrop of the bottom of the ocean and even 4 progressive jackpots, this game is sure to spark your interest. Playable from 0.20 to 10.00 and with fun bonus features, this online slot can boost your bankroll! Conquer the Kraken bonus – if you collect 50 torpedoes you trigger the bonus round and get a chance to win up to 500 times your bet. Target any three tentacles of the kraken to get to the treasure. Dive Mode – 5 diving helmets will take you to dive mode. Here you get 9 free spins. Here the chest of treasure is a scatter and it will award great scatter pays. Wild – the eye of the kraken is the wild and, except for the scatter, it will substitute all the symbols. Wild Kraken Tentacles – at random, kraken tentacles can take over the reels and replace one or more symbols, turning them into wilds. The online slot has an RTP of 96.41% and medium variance. Try it now if you wish to defeat the kraken and win big!